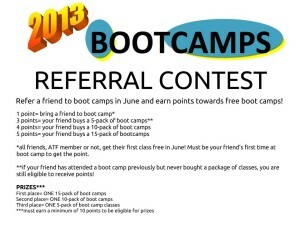 This June at Anytime Fitness in Cedarburg you can earn points just by bringing and referring friends to BOOT CAMPS! For each new friend you bring to a class, and for each friend that buys a boot camp package, you can earn points to win a free boot camp package for yourself at the end of the month. The top three point-earners will be rewarded with a 15-, 10-, and 5- pack of classes. Non-members are always welcome, but for the month of June, they will also be able to buy boot camp class packages at member pricing! Spread the word and bring a friend! Previous Post:My 24 day challenge starts today!